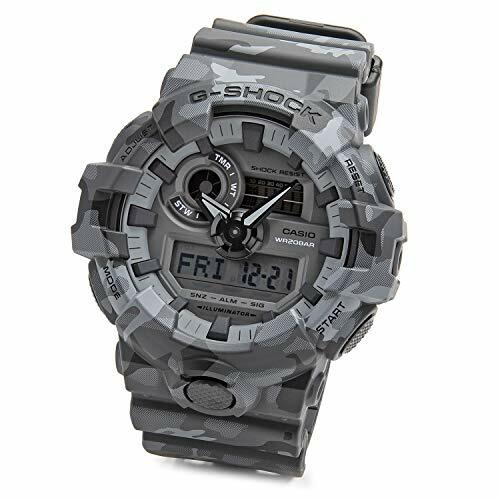 The fashionable Casio G-Shock GA700CM Analog-Digital Men’s Watch features realistic camouflage pattern, 3D bold hands and iconic front button design which allows full control of the Super Illuminator LED backlight. Additionally, the watch is equipped with standard G-Shock technology, including 200M Water Resistance and Shock Resistance. The model also features World Time with 31 time zones that include 48 cities + UTC, as well as 4 Daily Alarms, 1/10th second stopwatch, a countdown timer, and 12/24hr formats, all in a 53.4mm case. Synonymous with toughness, the Casio G-Shock watches never stop to impress us with the new twists on the seemingly perfect timepiece. ✔️DETAILS: Shock Resistant, 200 Meter Water Resistant, Super Illuminator LED Light with Afterglow (selectable illumination duration 1.5 or 3 seconds), World Time, 31 times zones (48 cities + UTC), daylight saving on/off, home city/world time swapping. ✔️G-Shock is, designed to resist mechanical shock and vibration. Its full form is Gravitational Shock. The ultimate tough watch. Guided by a “Triple 10” development concept, the design teams sought a watch with 10-meter free-fall endurance, 10-bar water resistance, and 10-year battery life.